Frame: 2" Walnut and gold with cream mount. Frame: 1" Plain wirh dark green mount. With various vignettes of sporting scenes form the past. An original pencil signed engraving. Frame:1" plain black with dark green mount. A Study of a chestnut horse in landscape by John Emms. An original oil on canvas. Signed "JNO Emms 1898". Frame: 4" Black wood with gold slip. 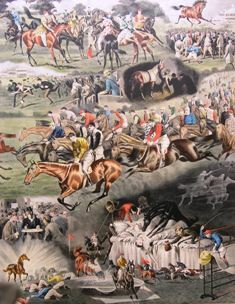 Jenkinstown's Grand National 1910 by Alfred Bright. Glenside's Grand National 1911 by Alfred Bright. Framed in 1" old gold. A Fox and a Pheasant in winter English 19th century watercolour. An original watercour signed by the artist. red mount & framed in 2" old gold. Artist unknown.